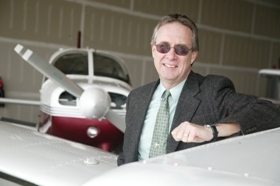 Dale Wilson joined the faculty in the Department of Aviation at CWU in September 1996. Prior to this, he taught for thirteen years at the Institute of Aviation at Trinity Western University in Canada, where as a Class 1 Flight Instructor he provided academic instruction and flight training to private, commercial, multi-engine, and flight instructor pilot candidates. He also provided training in mountain flying and tail-wheel operations. He has over 3,600 flight hours, and holds Airline Transport Pilot certification in the United States and Canada as well as FAA-certified flight and ground instructor certificates. His formal education includes a Master's degree in Aviation Safety and a Bachelor's degree in Psychology (human performance emphasis). His passion is aviation safety. To that end he teaches courses dealing with flight crew physiology, psychology, and safety; aviation safety management; and aviation weather. Since his arrival at CWU he has published several safety articles and presented papers at national and international conferences on the visual limitations of flight and the problem of VFR flight into instrument meteorological conditions (IMC). See list of publications and links below. While in Canada he held the Class 1 Flight Instructor Rating (the highest of four levels), and since 1999 he has been awarded the "Master CFI" designation from the National Association of Flight Instructors (NAFI) seven times. He won the CWU Alumni Association "Excellence in Teaching Award" for the College of Education and Professional Studies in 2001 and was nominated for the university-wide "Distinguished Professor in Teaching" award in 2004. He served as an FAA-designated “Aviation Safety Counselor” for the Spokane FAA office since 1999, and now serves as an “FAAst Team” representative. Mr. Wilson chose CWU because he was impressed with both the quality and quantity of the flight and academic curriculum offered and because of the opportunity to continue to engage in research and education related to flight crew safety. His interests outside of aviation include spending time with his family, worshipping at Mercer Creek Church in Ellensburg, reading, and riding his 80cc Honda Scooter around E-burg and his four-wheel Yamaha Banshee in the sand dunes of Oregon, Washington, and Idaho with family and friends. Professor Wilson's research interests include: pilot decision making (especially how it applies to the decision to continue VFR flight into deteriorating weather); visual landing illusions; and, night flying. He has written (or co-authored in some cases) the following articles, some of which are included in the links below. Wilson, D & Binnema, G. (2014). Managing Risk: Best Practices for Pilots. Newcastle, WA: Aviation Supplies & Academics. More information about paperback and digital versions can be found HERE. Wilson, D. R. (2016, October). Inadvertent Errors: Cognitive limitations in human perception, attention, memory and decision making play a role in many aviation accidents. Wilson, D. & Underhill, J. (2014, Jul/Aug). Managing Weather Threats (Part II): Inflight Countermeasures. NAFI Mentor, 16(4), 30-35. Wilson, D. & Underhill, J. (2014, Mar/Apl). Managing Weather Threats (Part I): Preflight Countermeasures. NAFI Mentor, 16(3), 12-16. Wilson, D. & Underhill, J. (2014, Mar/Apl). Managing Risk: A Threat & Error Management Approach. NAFI Mentor, 16(2), 20-24. Sloan, T.A., Lundin, M., Wilson, D., & Robinnette, R. (2010, Fall). The use of test anxiety assessment and anxiety reduction training to predict and improve performance of collegiate pilot trainees. Collegiate Aviation Review, 28(2), 60-68. Sloan, T. A., & Wilson, D. R. (2009). Assessment and intervention strategies for test anxiety in aviation students. Journal of Aviation/Aerospace Education and Research, 19(1), 9-14. Wilson, D. R. (2004, February). Deceptive approaches: Helping students overcome landing illusions. NAFI Mentor, 6(2), 8-11. Wilson, D. R., & Sloan, T. A. (2003). VFR flight into IMC: Reducing the hazard. Journal of Aviation/Aerospace Education and Research, 13(1), 29-42. Wilson, D. (Dec 2013/Jan 2014). Don’t Get Caught in the Dark: Managing the Risks of Flying at Night. The Transponder, 13-14. A publication of the Alaska Airmen’s Association. Wilson, D. Managing Risk. Presented at Northwest Aviation Conference & Trade Show, Puyallup, WA, Feb 20 & 21, 2016. Wilson, D. VFR Flight into IMC: Avoiding the Trap. Presented at the Alaskan Aviation Fall Safety Seminar, Anchorage, Nov 15, 2014. PowerPoint PDF available HERE. Wilson, D. Flying at Night: Don’t Get Caught in the Dark. Presented at the Alaskan Aviation Fall Safety Seminar, Anchorage, Nov 15, 2014. PowerPoint PDF available HERE. Wilson, D. VFR Flight into IMC: Avoiding the Trap. Presented at the Aviation Safety Standdown, Boise, Oct 17, 2014. Sloan, T. A., & Wilson, D. R. (2000). Avoiding a midair collision (unpublished paper). Presented at the 11th Annual International Women in Aviation Conference, March 9-11, 2000, Memphis, TN. Wilson, D. R. (1999). Educating pilots on the hazards of visual flight at night. Proceedings of the 2nd annual Instructor Conference: Innovations in flight instruction, April 9-10, 1999 (pp. 261-270), Daytona Beach, FL. Wilson, D. R. (1997). Trapped by the Weather or Trapped by Ourselves? The Problem of VFR Flight into IMC (unpublished paper). Presented at the 10th Annual Get S.E.T. (Safety, Education, Training) Workshop, April 4-6, 1997, Calgary, Alberta. Reviewer for the Journal of Aviation/Aerospace Education and Research, a refereed scholarly publication for educators and researchers as well as professionals in the aviation and aerospace industry. Reviewed two chapters on aerodynamics (Chapter 10 & 11) for Heath Science Dimensions 8, an 8th grade science text adopted by the province of Manitoba, 1992.